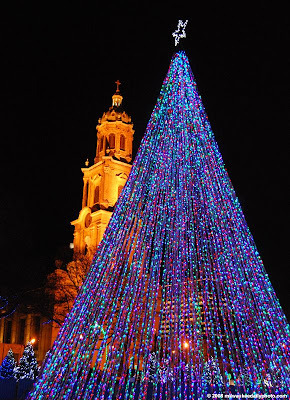 As part of the Holiday Lights Festival, the lights are up in Cathedral Square Park. Christmas trees decorated by various community organizations and schools are on display, in addition to the lights that fill the park with colorful glow. If this is just a sample of what's in that square, then it must look really magical! I love this, especially with the cathedral all aglow like that! Wow this is a gorgeous shot! Love the golden glow of the building with those purple lights!